Pronunciation is a deeply subjective business, as anyone who has ever compared notes on regional speech knows immediately. How do you pronounce that name, or that common word? How do you explain an accent? How do you figure out what a language is supposed to sound like, especially if you don’t know anyone who can speak it to you? Happily, language scholars in the last century developed an alphabet of symbols that is designed to bring an objective standard to pronunciation, or as much as that is possible when we’ve all got different ears and mouths. The International Phonetic Alphabet (IPA) is that symbol set, and it is a wonderfully useful tool. It is definitely a useful tool for a recreational medievalist; no language spoken today sounds exactly like any language spoken before 1600, and if we’re trying to puzzle out the sounds of bygone speech, it helps enormously if we’ve got a decoder key on which we can all agree. The IPA can be a bit bewildering at first—and no wonder! It was designed to enable the transcription of every single language sound currently in use. That means that, no matter how comprehensive your transcription in a single language, there are hosts of symbols that are entirely superfluous. Moreover, the symbols are designed to allow for a great deal of nuance—and when you are just beginning to grapple with the alphabet, that degree of fine-tuning can be more muddying than clarifying. To enable a fast start, we are going to concentrate on the most common symbols used in English pronunciation, and enhance that with the additional symbols that reflect sounds specific to commonly-heard European languages. This is an introduction; for suggestions on how to go further, please see the resource list at the end. phone: a precise, technical term for a single speech sound. We will be talking about two groups of phones – consonants and vowels. voice: vibration of the vocal cords during the pronunciation of a phone. 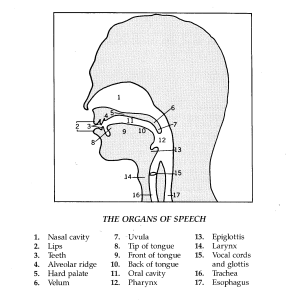 If you place your fingertips on your larynx, you can feel it vibrate when you pronounce a voiced phone (like the “th” in “thy”), but it does not vibrate when you pronounce a voiceless phone (like the “th” in “thigh”). 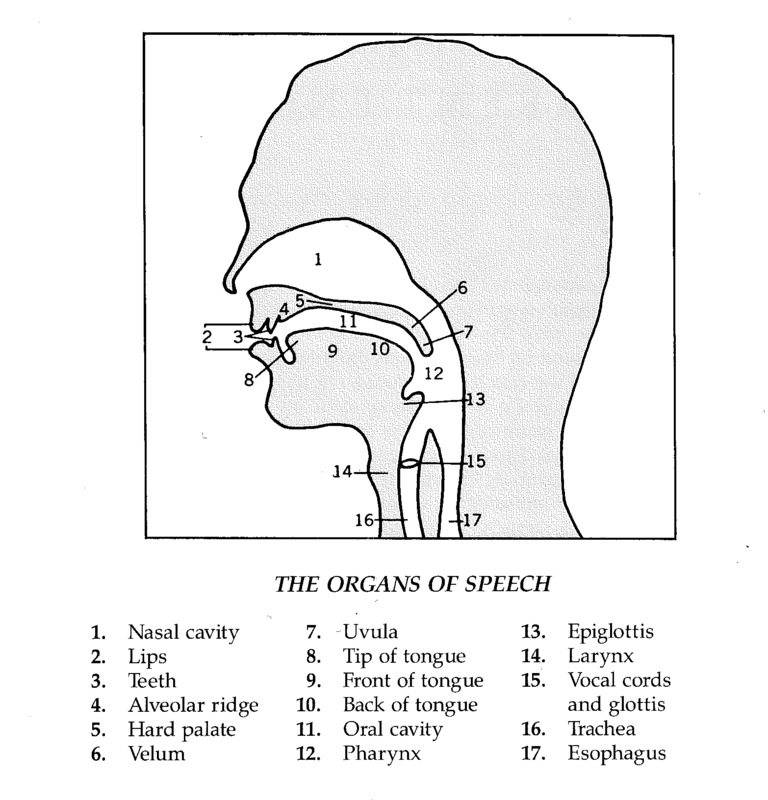 Consonants may be voiced or voiceless; vowels are almost always voiced. diphthong: a sequence of two vowels in the same syllable. Modern American English is extremely diphthong-heavy; many European languages are not so at all. stop: a sound that is made by blocking airflow entirely, with lips or tongue. Also called a plosive. nasal: a sound that is made by partially blocking airflow, so that air moves through the nose. fricative: a sound that is made by using the lips, tongue, and/or teeth to force air through a constricted channel. affricate: a sound that begins like a stop, with a blocked airflow, and continues like a fricative, with a narrowed channel of air. flaps and trills: one or several flips of the tongue against the back of the ridge behind your teeth (the alveolar ridge). – Labial phones involve the lips. Bilabial phones involve both lips. – Dental phones involve the teeth. – Alveolar phones involve the alveolar ridge, the hard ridge just behind your top teeth. – Palatal phones involve the hard palate, in the roof of your mouth. – Velar phones involve the velum, or soft palate, toward the back of the roof of your mouth. – Uvular phones involve the uvula, right at the back of the roof of your mouth. – Glottal phones involve the glottis, all the way down in your throat. As you practice each phone, pay special attention to where the parts of your mouth are, and how they feel! Exciting homegrown tables forthcoming, but until they’re here, check out this excellent site that offers a guide to IPA symbols and sounds. From the University of Sheffield – The University of Sheffield hosts a page that does exactly one thing: it provides a table of all of the IPA symbols. Clicking on each symbol pops up a window that will tell you the description of the sound and show you a video of someone pronouncing the sound, complete with an animated cutaway of what’s happening inside the mouth. Great for pinning down exactly what sound is denoted by a symbol. A lovely Welshman named Simon Ager has created a site called Omniglot, which has an overview of an enormous number of languages. Most pertinently, each language page has a listing of all of the sounds of the language and how they are spelled and how they affect each other in various configurations—and those are all described using IPA symbols. Invaluable for puzzling out how exactly a particular spelling might be pronounced in a particular language. This is the website of the International Phonetic Association, who are the folks who develop and maintain the symbol set. Learn as much as you might have ever wanted to know about IPA here! Handbook of the International Phonetic Association: A Guide to the Use of the International Phonetic Alphabet, International Phonetic Association, Cambridge University Press, 1999. Exactly what it says on the tin. A book put out by the International Phonetic Association as a comprehensive guide; it describes how to put the Alphabet to use, clearly and thoroughly. Singing Early Music: The Pronunciation of European Languages in the Late Middle Ages and Renaissance, edited by Timothy J. McGee with A.J. Rigg and David N. Klausner, Bloomington: Indiana University Press, 2004. Provides detailed pronunciation guidance and sample texts for speaking and singing English, 16th c. Scots, Anglo-Latin, Old French, French Latin, Occitan, Catalan, Castilian, Spanish Latin, Galician-Portuguese, Portuguese Latin, Italian, Italian Latin, Middle High German, Late Medieval and Early High New German, German Latin, Flemish/Dutch, and Netherlands Latin, using IPA symbols. An audio CD is included with demonstrations of all of these languages, and recordings of the sample texts so that you can read along. NB: the textual examples on this page (coming soon!) were all drawn from this book.